The items, kits or jewelry sold on this site are not intended for children's jewelry. This chart is a guide, compiled to the best of our ability in the confusing world of thread. Diameters are approximate. Always test the breaking strength yourself. 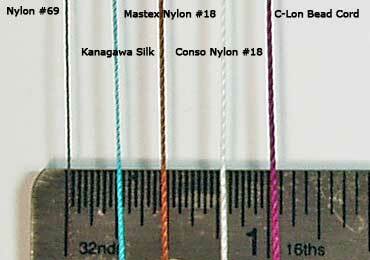 * Nylon #18 is a hand stitching nylon thread usually bonded. Do not confuse this thread with Nylon #18 Seine Twine, a much thicker cord used sometimes for macrame or Nylon Bead Crochet Size 18 a larger nylon thread/cord used for crochet of accessories such as purses and belts. ** Tuff Bead Cord Size 1 official diameter is quite a bit thicker than the C-Lon Micro Cord, although when comparing the two cords they seem very similar. About the Manufacturing of Thread - Each time a specific color of thread is manufactured minute differences may occur. The color may vary a bit even though the same dye lot formula is used, aka 'dye lot drift'. The finishing or bonding process may also vary a bit, so one lot/batch of spools may have a slightly different hand or feel. When noticeable differences in dye lot or feel occur, it is annotated. Actual dye lot affect the thread itself as well, so as a general rule darker colors have a heavier feel than lighter colors. The actual thickness of the thread is altered by some of the dye. White nylon thread for example is always a bit thinner and has a lighter hand than colored nylon thread as it does not have any molecules of dyes attached to the molecules of nylon. Each bobbin/spool is approximately 1 1/8 inches in diameter and 1 5/8 inches tall and holds approximately 92 yards. (Metric: bobbin diam. = 28mm, height = 40mm, approx 84 meters of thread per bobbin.) Made in the USA. C-Lon Micro Cord - Thin beading cord from C-lon similar to Nylon #69. Breaking strength 11lbs, approx 0.12mm thick. Use for detailed micro macrame, stringing with small-hole beads, crochet with 11s and 15s. Available in 32 colors. Economical packaging when compared with other beading thread per yard! C-Lon Fine Weight Cord Tex 135 - This is the newer size of C-Lon Bead Cord, in between the Micro Size and the standard size. Introduced in February 2010. Breaking strength 24lbs, approx 0.4mm thick. Use for detailed micro macrame, stringing with small-hole beads, crochet with 8s and 11s. Available in 24 colors. C-Lon Tex 400 Beading Cord - Heavyweight beading cord. 48 colors. Introduced in May 2008. Colors matches C-Lon Bead Cord colors. Diameter approx .9mm, just a breath under 1mm with my calipers. It is thicker than the Tuff Bead Cord Size 7 and in between the Omega Nylon Crochet size #5 and #6. Breaking strength approx 75 lbs. With a self needle, it fits through 4mm gemstone beads, Miyuki 8/0s once and passes twice through Miyuki 6/0s. D&E/Mastex - Genuine D&E/Mastex Nylon #18 is back in production once again under a different company D&E (as of March 2009). Mastex is out of business. Made in the USA. Beadsmith Nylon #18 -The Beadsmith Nylon #18 was produced when Mastex went out of production for the first time in 2005. It has a heavier hand and it is more slippery, so harder to work with.Currently only Black & White are manufactured. Imported. Conso - No longer manufactured. Was one of the oldest American company producing Bonded Nylon #18, originally manufactured in the USA, then overseas, then brought back to the USA. Kanagawa 1000 Denier Embroidery Silk & Fujix Tire Silk - Filament silk, not spun silk, so the fibers are strong and do not shed. They have a lovely feel and sheen. The filaments are sturdy and well plied. They handle manipulation well unlike many other filament or spun silk. Great color range with the two brands combined! 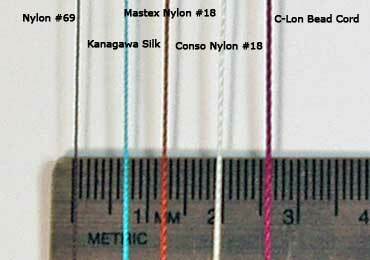 I have been using Nylon #18, Nylon #69, the Kanagawa Silks, Satin Cords and many of the thread currently sold in this online store for over 28 years. My personal supplies include the C-Lon Bead & Micro Cord lines, D&E/Mastex, Beadsmith, Conso, Tuff Bead Cord in Size 1 and 5, and my 'museum or vintage colors': nylon #18 no longer produced and manufactured, such as Robinson, Macrawold and discontinued colors by Conso and Mastex. I intermix them, use them individually and in combination. Color is usually my first criterion when choosing a thread, but quality is also an issue as different brands have different quality better suited for some specific uses. At one point I considered dyeing colors myself, but in order to get a good quality permanent dye, harmful chemicals need to be used, better suited for industrial settings. In October 2005 when I found the C-Lon line and got so excited with the new bright colors, 32 colors at that time. Imagine 3 purples, a chartreuse, lots of different pinks and a color line growing from 32 to 58 and now to 88 colors, and soon 116. Wow, what fun! C-Lon Micro Cord and Nylon #69 - I use nylon #69/C-Lon Micro Cord in conjunction with nylon #18. It is great for stitching, wrapping, finishing and hidden construction. I also occasionally use it to do part of a one of a kind piece, such as the micro-knotting of a mini cabochon for a very small gemstone with need of a very high count of knots per square inch. It is also a great thread for beading fine beads with small holes such as many of the semi-precious and precious faceted beads out on the market right now. Many of my customers use this thread for bead crochet and bead loom weaving. One of my customers made several wallets with beaded panels woven on a loom with nylon #69 about 15 years ago. Her wallets have been in use everyday for over 15 years with no sign of wear! Size - Standard commercial sizes or common thread weight/size is the thread's denier divided by 10 (e.g. a size 69 thread is 690 denier). Denier sizing is an old French sizing convention no longer used in Europe but still used in Japan for silk thread. There are two other thread size naming conventions - Government and Tex. When a thread's size increases, its strength and thickness increase and the number of yards per pound decrease. Bonded - Bonded thread is treated with resins that give it a tough, smooth protective coating. This improves the way the thread moves through your sewing machine and increases its abrasion resistance. Dye Lot Drift - Color shift between each lot even though the same formula has been used. More noticeable on lighter colors. Weight - Often refers to thread diameter, as in paper weight. Also can refer to spool size, as thread is often spooled by weight. Spools measured by weight may vary by as much as 10%.